You can expect to be greeted with sincerity and hospitality. Upon your first visit. you w ill be given a tour of the facility and offered hot herbal tea or water. Persephone’s walls are adorned with beautiful artwork, including a variety of murals to nurture young and old alike. Our main waiting room and treatment rooms have large windows that allow for natural lighting. This is because the center wishes to set an example of how to be more closely connected with nature and its rhythms and seasons, which is part of the naturopathic philosophy. Each room has a unique touch in regard to colors and ambiance. The first visit is usually at least two hours and sometimes longer. It is important for the doctor and the patient to spend quality time and energy on the session covering as much of the patient’s history as possible. You are encouraged to bring notes with your medical and biographical information, your current symptoms, and your hopes and goals. Having this information ready for the first visit will allow for more efficient use of the time together. Dr. Pautz puts her patients first and is committed to being a facilitator of healthy and fulfilling lives. 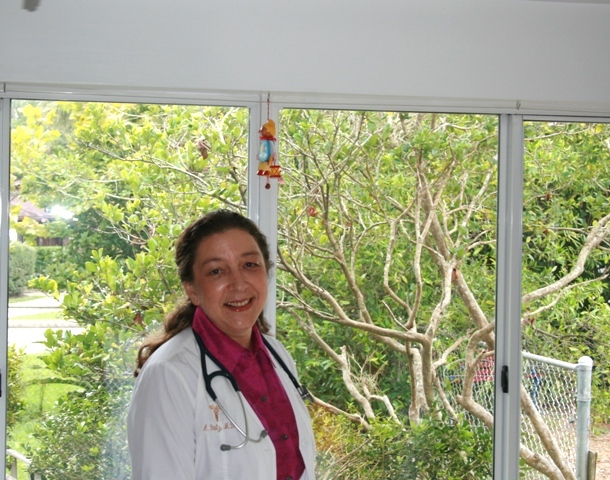 Yes, Dr. Pautz is a Florida licensed physician and is Board Certified in Internal Medicine, Diplomate of the American Board of Integrative Holistic Medicine (ABIHM). If a patient needs prescription medication as part of a medical treatment plan, she is able to prescribe as medically necessary and indicated. She is able to order tests such as labs, x-rays, pulmonary function tests, echoes, EKGs and many others or refer to a subspecialist. Persephone Healing Arts Center offers a different kind of healthcare which is focused on wellness, prevention, and proactive intervention on physical as well as biographical opportunities. This kind of care goes beyond a simple diagnosis and prescription. It requires more time, energy and attention from the doctor as well as the patient and makes use of a range of modalities and tools to support a person’s mind, body, and spirit on their journey to balanced health. Holistic medicine looks at the whole person in their entirety. The physical, emotional and spiritual aspects of wellness are all taken into account. Conventional medicine focuses primarily on the mechanical, biochemical and biophysiological aspects of health. In Holistic medicine, when one aspect of the three components (physical, emotional, spiritual) is not functioning optimally, it can throw the other two out of balance thus causing health issues. The Holistic philosophy believes that the three parts are interconnected in such a way that they affect each other and therefore cannot be separated when treating dis-ease or illness. Each doctor’s personal training and biographical journey defines their Holistic approach and may vary greatly. Dr. Pautz is Board Certified in Internal Medicine, Diplomate of the American Board of Integrative Holistic Medicine (ABIHM), which allows integrating the best of both disciplines and works in a balanced way between the two fields. Dr. Pautz is also an anthroposophic medical doctor. Anthroposophic medicine is an extension of conventional medicine and Holistic medicine. This approach presumes that the body is not an independent material organism and that optimal health depends on a balanced relationship between the physical body, the life force body, the soul, and the ego or spiritual part of us.